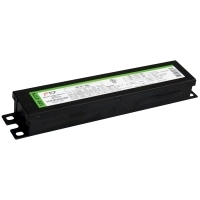 This TCP ballast is manufactured for 3 or 2 F32T8 and F28T8 lamp types. It is energy efficient, high efficiency, and has a high ballast factor of 1.18. The ballast is instant start, and includes multi-voltage technoloy that allows it to handle 120 to 277 voltage. The anti-striation control provides exceptional light quality. Its UL Type CC rating protects against arcing in electrical devices. The ballast measures 9.5 inches in length, 1.3 inches in width.